A vacationing Englishman (Denholm Elliott) stumbles upon a plot to kill a young American tourist (Beverly Bentley) in Spain. Scientist Jim Grayam saves his boss' wife from suicide but falls in-love with her and plots to kill her husband by pretending to be criminally insane. Oliver Larker: [narrating] I haven't been away from my flat in 9 years, and 6 mysteries. But, I suppose the creator of a private eye has to get out in public every so often. And I hate to travel - unless it's in the Commonwealth. Otherwise you meet so many foreigners, who don't even speak English. And all those beastly tourists - mostly Americans. They don't speak English either. Silly and stupid but with one or two good points. Mostly when people discuss this film they get sidetracked by the Smell-O-Vision aspect. It was made at a time when there was a lot of experimentation with the technology of film making. In the decade previously they had tried 3-D and Cinerama, so adding aromas to film didn't seem that far out of bounds. The technology really wasn't ready as yet and the film, "Scent of Mystery", wasn't good enough to stand on its own. The story was silly and the dialog was stupid. The original film no longer exists as such. Another film called "Holiday in Spain" was cobbled together from pieces of various prints. Some say, therefore, you can't judge the original by the copy. However, the copy does have a strongly coherent narrative flow. It's the original that was stupid. The actors were competent professionals and there is the occasional clever line, but there is a certain amount of embarrassment in watching talent going to waste. There is an inside showbiz secret society feel to it. It's Elizabeth Taylor and her then husband Eddie Fisher working with Mike Todd, Jr. trying to salvage the botched job his father had done. 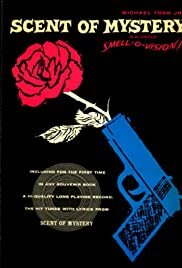 By the way, what I said earlier about the addition of aromas to dramatic entertainment, watch what happens when V. R. adds story lines and acting. They are already adding tactility to V. R. Can odor be far behind?